When you hire a pool contractor in Salt Lake City, he or she can give you a rough estimate of the time it’ll take before you can take a dip in your new pool . The length of time depends on the type and size of in-ground pool you’re having built. 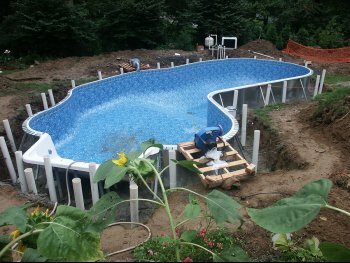 In general, most concrete pools can be installed in four to six weeks. Vinyl swimming pool installation takes about two to five weeks. The length of time you’ll need to wait depends on a number of factors, including how long it takes to get the right permits from your municipality. Some local government agencies take longer than others to issue them, and the pool contractor can’t start until a permit is issued. The excavation may take just a day or two, or up to a week if there are utility lines in the area. Then, it may take one to two weeks to lay the steel, and install systems like plumbing and electrical. After this, the actual pool can be installed in one to three weeks, depending on the type of pool you’ve chosen. After this point, all that remains to be done are your preferred finishing touches, like the deck installation, landscaping, custom lighting, as well as any additional features like waterfalls. There’s nothing quite like a relaxing dip in a hot tub on a chilly evening. If you’re anticipating an upcoming hot tub installation at your home near Salt Lake City, there are a few things you should know. First, read the owner’s manual thoroughly, and ask the hot tub installation expert if the company also offers maintenance services. Since there’s a sharp learning curve to owning and caring for a hot tub, having the experts perform maintenance tasks may be preferable for you. For safety’s sake, don’t exceed the maximum temperature listed in the owner’s manual. If you have kids, your hot tub shouldn’t exceed 100 ºF. Invest in a high-quality, insulated hot tub cover for both safety reasons and energy efficiency. Your hot tub should be covered and locked whenever you aren’t using it. Even if you don’t have kids, restricting access with a lockable cover can protect curious kids and pets from throughout the neighborhood. Hot tub chemistry isn’t identical to swimming pool chemistry. You could use chlorine for a hot tub, but you probably won’t want to. When it’s mixed with very hot water, chlorine treatments give off a strong, unpleasant odor. Many hot tub owners prefer to use bromine or alternatives like biguanide sanitizer or mineral systems. Refer to your owner’s manual or hot tub installer for in-depth advice on pH levels, calcium hardness, clarifiers, and cleaners. Remember to drain and replace the water in your hot tub about every three to four months. Every new hot tub owner should know where the filter is. Remove it and clean it once weekly, and replace it entirely at least every year. Staying on top of your filter maintenance will help prevent costly damage to the hot tub. Hot tub maintenance shouldn’t take up too much of your time, but you might prefer to have a professional handle it for you, regardless. After all, you’ll want to give yourself plenty of time to get the most enjoyment out of your new water feature. Try a nice long soak before bedtime to help you fall asleep faster, and go for a dip whenever your muscles feel tense. In addition, once your spa is installed, you might notice that family and friends start to hint that they’d like an invitation, so consider keeping spare towels, swimsuits, and robes on hand for last-minute guests.